Cash-strapped graduates renting in London are spending upwards of 45% of their take home pay on rental payments, according to the latest Landbay Rental Index, powered by MIAC. As thousands of graduates across the country flock to the capital to begin their first job this month, many will be looking for an affordable place to live. Despite London’s infamously high rents, the capital is home to a quarter of all new graduates who move within six months of finishing their degree. Those hoping to live alone face spending 73% of a London graduate’s average post-tax income of £1,972 on £1,445 of rent. 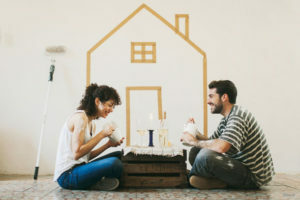 In a shared house of two people, overall rent of £1,917 adds up to 49% of each tenant’s income, while those co-habiting in a three-bed property would each spend 45% of their monthly take home pay on rent of £2,683. Of the London Boroughs, the most affordable average residential rents of properties are found in Bexley (£1,004), Sutton (£1,506), Havering (£1,072), Croydon (£1,125) and Bromley (£1,169). Bexley has seen the strongest rental growth of all the boroughs with a 1.98% rise in average rents over the last year. A growing demand for property in outer London has clearly already impacted these outer regions. For those seeking greater proximity to the city and with the coveted London postcode, Lewisham is the most viable option. Average rental prices of £1,232 make it the 8th most affordable London borough, also being just 15 minutes via train from the City of London. At the other end of the spectrum, the most expensive average rents are unsurprisingly found in the traditionally desirable regions. Kensington & Chelsea (£3,042), Westminster (£2,891), Camden (£2,219), City of London (£2,074) and Hammersmith & Fulham (£1,886) were found to be the most expensive boroughs to rent in with prices being well out of reach for those on a starting salary. It’s telling that all five have seen rents fall over the last year by -2.36%, -2.38%, -1.13%, -2.35% and -1.67% respectively as prime locations have suffered a fall in demand in both sale and rental markets. “Faced with record high student debt levels and the rising cost of living, it will be little surprise to see graduates starting to look elsewhere from the traditional young professional hot spots such as Fulham and Camden when they come to London. Surrounding areas are clearly worth the longer commute to reduce the rent burden and give them any hope of saving for a deposit on a house of their own one day.